Sometimes nature's course can be very inconvenient! 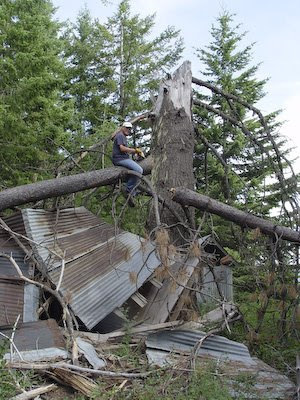 An electrical storm passed through the mountains a year or so ago, knocking down the top of a huge tree near the homestead cabin at the other end of our property. 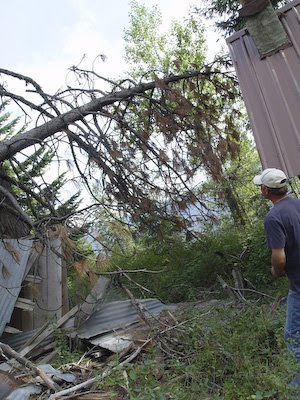 Fortunately it didn't land on the cabin, but it did crush a dandy little storage shed nearby. 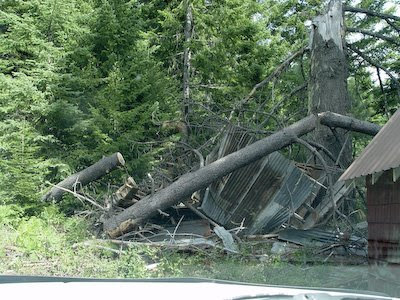 Months later, another storm blew down a smaller pine tree, creating quite an unsightly mess. Last week Brent removed the larger tree top, but this week he decided to tackle the smaller one that was suspended in the air. Of course, I think he believes that he's still twenty, so up he climbed, onto the smaller tree. His plan --- to cut off the end of the tree. Yeah! It worked and he was quite pleased. Getting back down was the next problem, but with the help of a large chain, he was able to lower the chain-saw to the ground and then walk back down the tree trunk. Whew! He made it safely back to earth! And now the work begins. 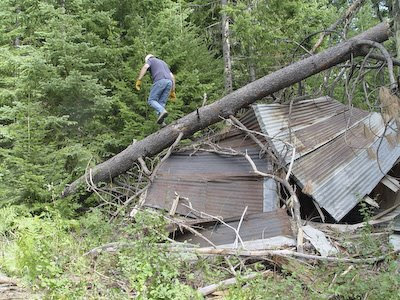 Trimming, pulling log sections with chain and truck, and lots of picking up of old wood that had been the shed, and more await. He was busy! All this work --- at the place where Brent is most content --- maybe he should have been a logger! Enjoy a peaceful week, my friends! Indeed our menfolk love the outdoors. I'm thinking mine would love to be helping yours today but he's back to tending the farm. 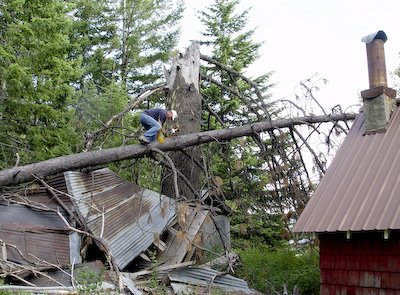 It is incredible how a wind storm can create a huge mess/ a huge mess of firewood. I'm glad he made it safe so far and may he continue to enjoy the task until he's done. Glad he is safe. If you ever get a chance, both of you might enjoy watching a lumberjack show -- we see them at our (Minnesota) state fair. Young men doing log rolling (sort of dancing on top of a log as it's in the water -- keeping their feet moving so they, hopefully, don't fall in), tree climbing and chainsawing. Of course, it might give him more ideas. Goodness - I could just see him getting through that last inch and having the whole balance of the tree shift and he flying through the air like so much baggage! Praise be to God for his safety and good sense!